Ajapsandali (Georgian: აჯაფსანდალი) is a Georgian vegetarian/vegan dish popular as a family meal, especially in summer. 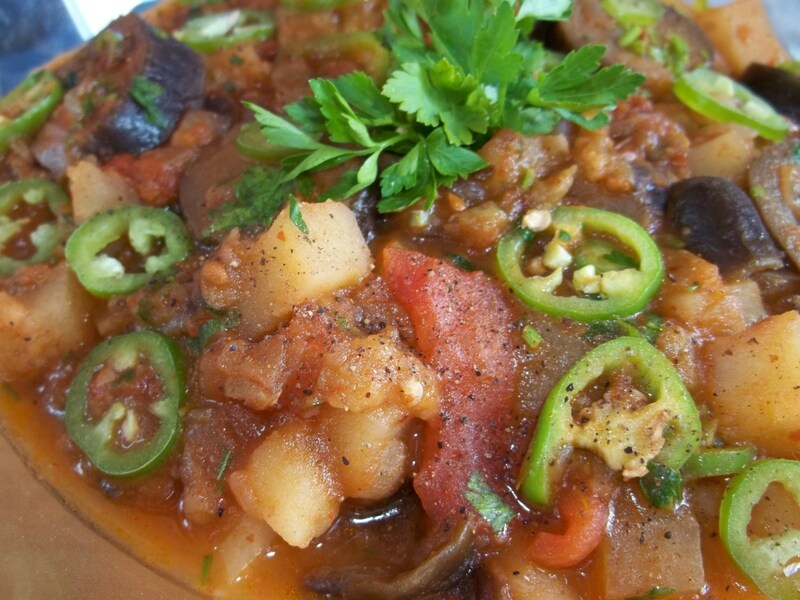 There are many variations but they will always contain eggplant, potato and tomato. Click here to see another version that uses red peppers, garlic and spices. 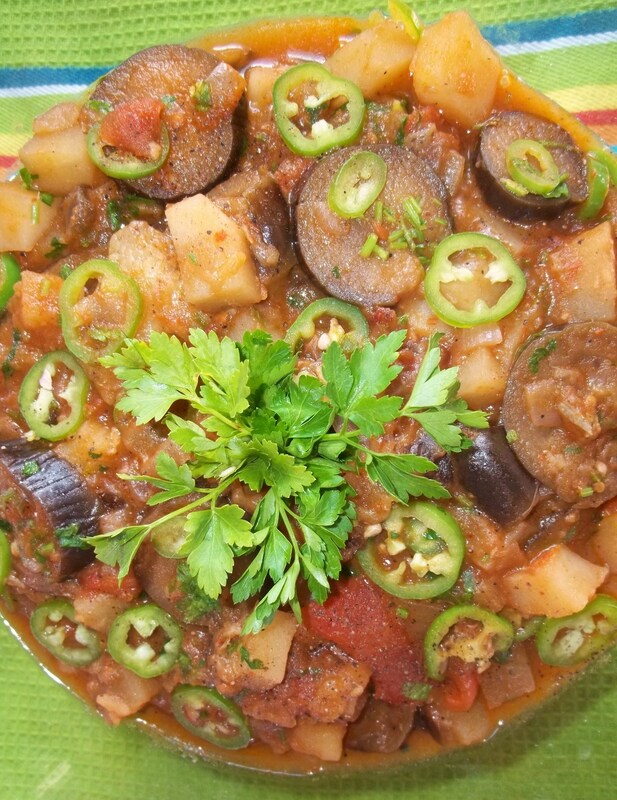 Ingredients: 600 grams of potatoes, 800 grams of eggplant (aubergine), 4 large juicy tomatoes, 3 large white onions, 2 hot green peppers, 30 grams fresh green coriander, 30 grams of fresh parsley, half tsp of black ground pepper, salt (amount dependent upon personal preference) and 7 tbs of oil. Preparation: Chop the onions. Add 7 tbs of oil to a pan. 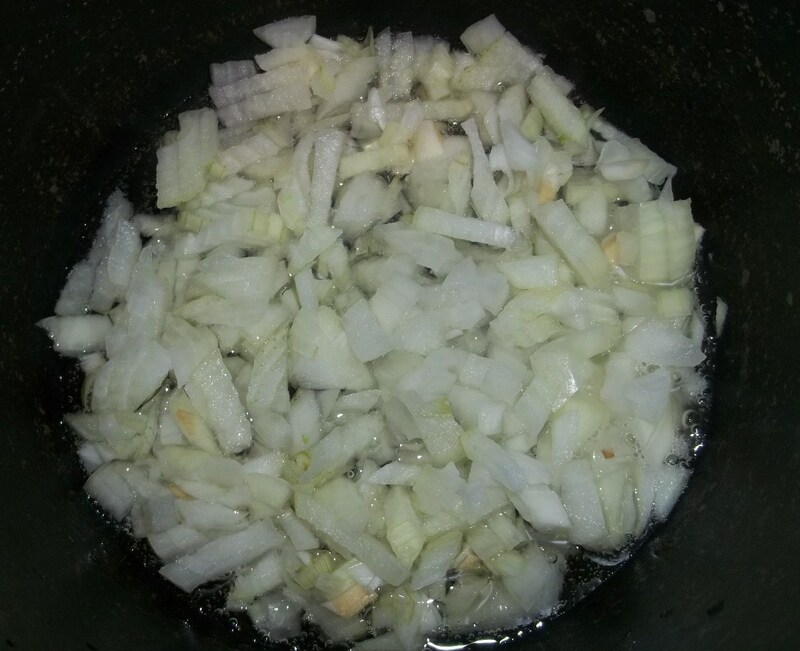 Add the onions and fry on a high temperature for 2 minutes, stirring frequently. 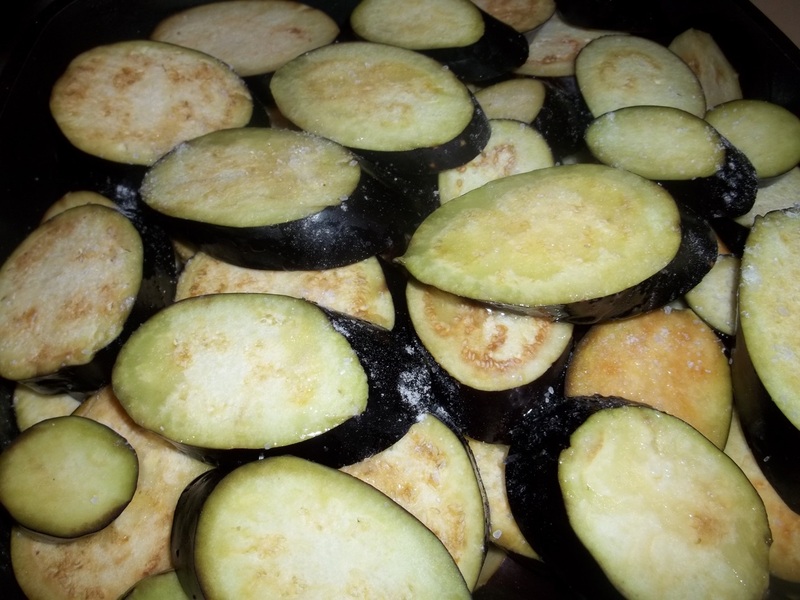 Slice the eggplant and add to the pan of onions. Stir and fry on a medium to high temperature for 5-6 minutes, stirring frequently. Peel and chop the tomatoes and potatoes and add to the pan. If your tomatoes are not very juicy, add up to 100 ml of water. 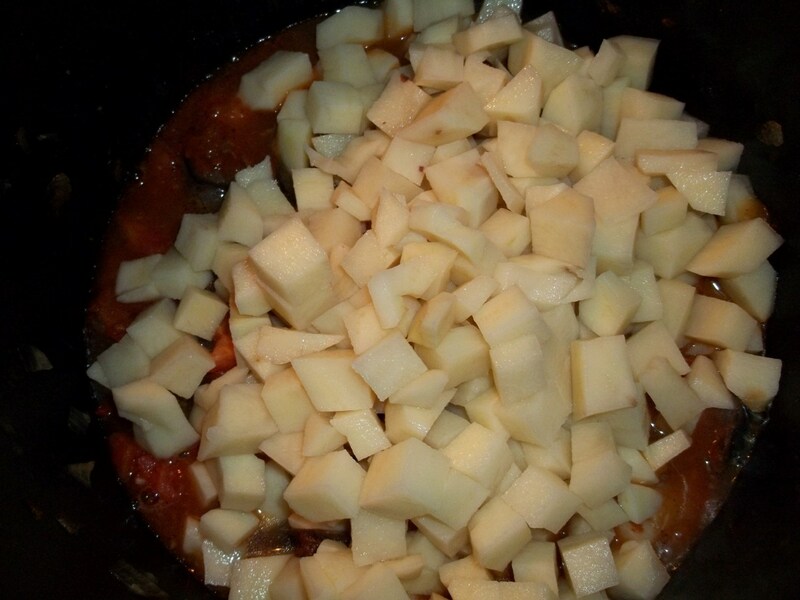 Stir and cover and cook on a low to medium temperature until the potatoes are cooked. 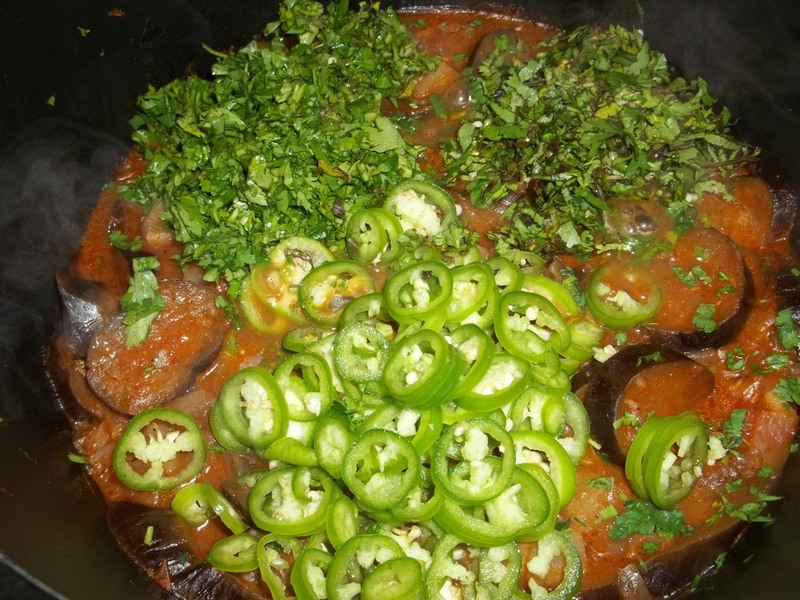 Slice the hot green peppers and finely chop the parsley and coriander. Add to the pan. Stir. Leave it to cook on a low temperature for 2-3 minutes and then remove from the heat. Serving: Ajapsandali can be eaten hot or cold. We garnished ours with fresh parsley and a little black pepper.